This picture was taken at New Hampshire Motor Speedway…home to The Loudon Motorcycle Classic, two NASCAR Cup Series race weekends, The Loudon Road Race Series and many other major motorsports events. NHMS is one of my favorite racing venues. Located just south of the White Mountains of New Hampshire, this state-of-the-art racing facility is surrounded by beautiful countryside. 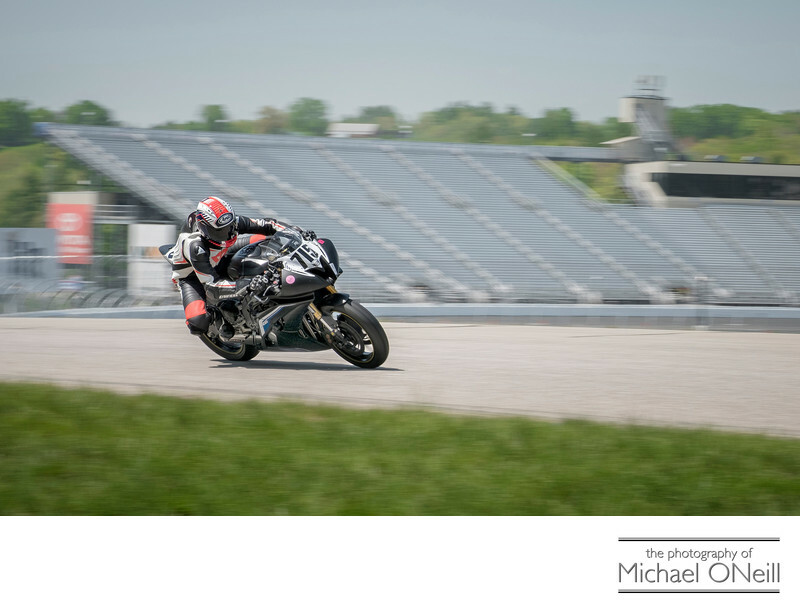 I love photographing the motorcycles on the road course at New Hampshire Motor Speedway. This image was taken on the uphill backstretch from a position very close to the "tree house"…the race official’s tower on that section of the course. The bikes come out of a left hand hairpin turn and charge uphill. Using an in-camera motion blur technique enabled me to accentuate the speed of the incredible two wheeled racing machines. I am available for assignment for any event tube held at New Hampshire motor Speedway. I am familiar with the procedures and personnel to secure credentials for racing events here. In addition to NHMS I have regularly documented events on other race tracks in the northeast United States. I have covered National NHRA (National Hot Rod Association) events at New England Dragway and Old Bridge Township Raceway Park for the Mello Yello NHRA Drag Racing Series. I have photographed motorcycle and car racing events at Watkins Glen International, Lime Rock Park, Thompson Motor Speedway, Stafford Motor Speedway, Riverhead Raceway and New Jersey Motorsports Park. Whether you’re part of NASCAR, NHRA, MotoAmerica, Indy Car, IMSA or The Pirelli World Challenge I have what it takes to deliver dynamic motorsports images to you.